Service Costs > How Much Does Clock Repair Cost? How Much Does Clock Repair Cost? Clock repair may be necessary for a variety of reasons. Whether it’s a grandfather clock or smaller antique clocks, the parts can tend to wear away over time. Since these clocks can be valuable, it would be a waste to throw them away when they stop working. Instead, there are professionals out there who can perform a repair job for a cost. The cost of clock repair will depend on the repair that needs to be done, the complexity of the repair, the type of clock and professional performing the job. On average, the cost to have a clock repaired can vary anywhere from $25 to as much as $2,500+. A simple oiling and adjusting can cost $100 or so, while extensive repairs and overhauls can start at $250 and go from there. Refer to our table below to see what the average clock repair could cost. If the gears and suspension need to be replaced completely, for example, the price can be quite high; however, if the clock needs a simple tune up and polish, the price can be anywhere from $25 to $75 mark. A cuckoo clock, on average, can cost $200 to $400 to repair. A clock with animation will usually cost 30 to 50 percent more than one with no animations. Also, the more weights that the clock has, the higher the price can be. Someone on MerchantCircle.com, for instance, asked this very question. One merchant said they would come to your home, disassemble the movement and ultrasonically clean it for $160 or $180 if bushings were needed. Another said cleaning, checking for worn out parts, oiling and lube would cost $160, but if you were to need a repair, the costs could be in the $350 to $1,5000, depending on the age and the brand. Almost all clock repairs will require an overhaul unless it’s considered a simple repair. An overhaul will include a complete disassembly, thorough cleaning, pivot cleaning, new bushings, hook tightenings, click rivet tightenings, straightening bent teeth, lubrication, oiling, reassembling and re-testing. Usually, to make a dirty and worn clock run well, a complete overhaul is almost always required. In addition to these repairs, these professionals can also move grandfather clocks or even package them for an upcoming move or delivery. Most professionals should include a warranty that can last up to three years. This warranty will cover the parts and labor. That way, if something goes wrong, it can be repaired at no cost. If you prefer to ship the clock out of state, shipping and insurance charges can apply. A smaller clock can cost $25 to $65 to ship while a larger clock, such as a grandfather clock, can cost hundreds to ship. Repairs that have to be expedited can add to the total bill, often as much as 50 percent. Most clock shops will make house calls up to a certain distance. House calls can start at $55 and can go up depending on the miles driven. 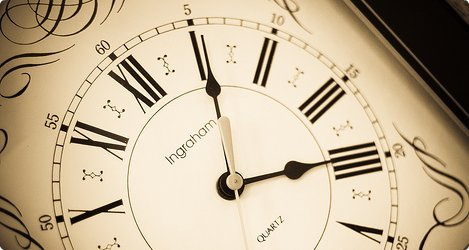 A reputable clock shop will often have a large backlog. Talk with the shop to see how long it will take to get your clock back. Do not be surprised if you are told it can take up to three months. Most experts can give a great estimate over the phone. All you will have to provide them with a description of the problem if you know what’s wrong. Even if you’re unsure, you can explain the symptoms. Some clock repair jobs are relatively simple. Search for the problem online, and see if you can find any information on how to fix it. Look for videos and how-to guides. If you feel comfortable with the repair, parts can cost as little as a few dollars. Do your research and see if the clock is worth the price of repair. Check prices of new clocks online to see if you can get a replacement for a better value. The only time that people tend to repair a clock is if it has some sort of sentimental value. If you’re able to bring a clock to the shop, most professionals will be able to offer an estimate for free. Works very well now! we are happy as the clock was my mothers.